Vertical rigid pile inclusions are frequently used as supports for the foundations built on soft soils. They act as load transferring elements onto more resistant and less compressible soils. 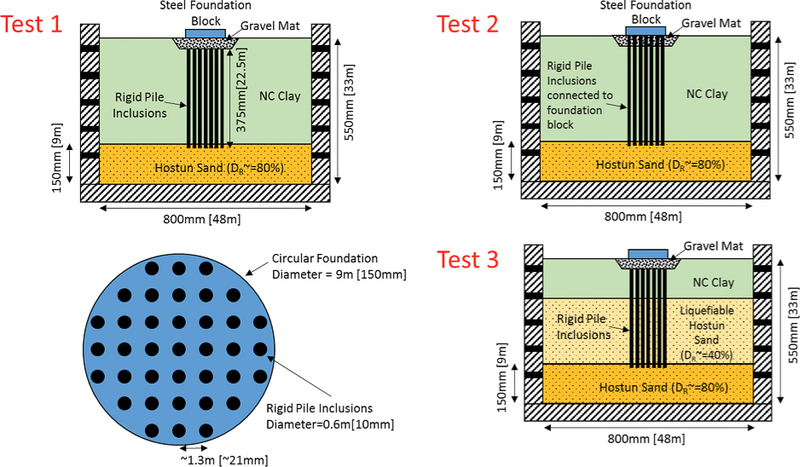 Although the rigid pile inclusions are envisaged as a form of ground improvement method in current design practice, their performance in transferring loads on the structure under dynamic conditions are not well studied. Some of the recent examples, where rigid pile inclusions not connected to the structure are used as foundation support, include the New Mexico City Airport (NAICM), Rion – Antirion and Izmit Bay Bridges. There is increasing interest in assessing whether such foundation systems offer an advantage in terms of seismic demand on the structures over traditional pile foundations where the piles are connected to the structure through a raft or pile cap. Moreover, the performance criteria set out for such foundation systems may also require some measure of pile structural assessment. Apart from detailed numerical Dynamic Soil-Structure Interaction (DSSI) models, there is no widely-accepted method for the assessment of this type of foundation systems. In this context, centrifuge testing can provide useful insight in terms of the underlying physical mechanisms for the load transfer. The main objective of this research is to study the seismic behaviour of rigid pile inclusion systems. The focus of the study will be the dynamic soil-structure interaction mechanisms involved in these systems in particular. Three small-scale dynamic centrifuge experiments using the beam centrifuge at the University of Cambridge are proposed that will supply information about the inertial and kinematic interaction between the rigid pile inclusions and the structure. Numerical models calibrated based on the experimental results will also complement the study. The study will be used as a basis for further study through the dissemination of the research outcome.